All have one similarity, either the savoury white colour version of frying or the sweet black colour version of frying. 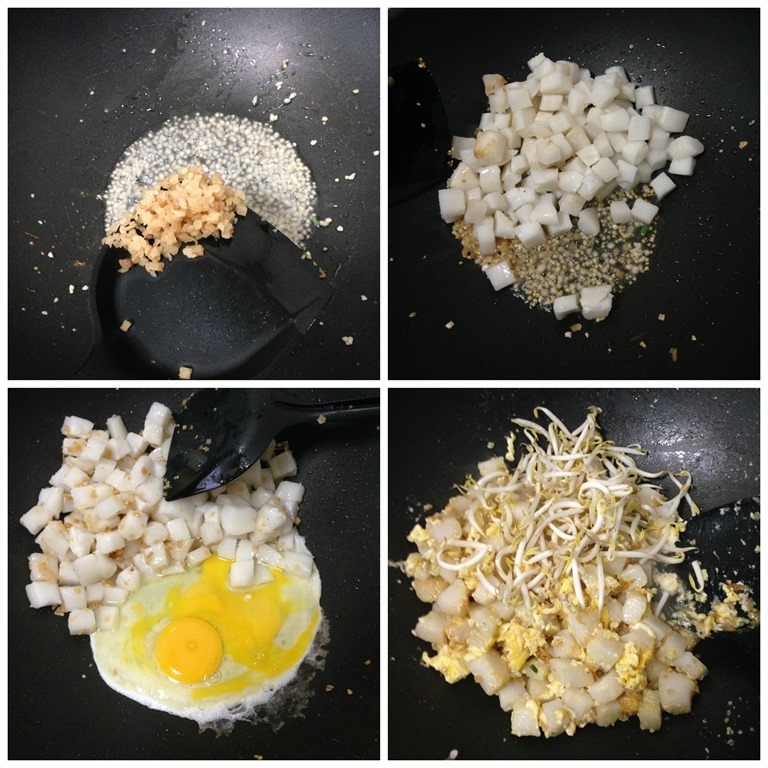 The most basic version of the dish will be stir frying the rice cake, eggs with seasoning and soya sauce (for black version). But there are some variants in between the areas. 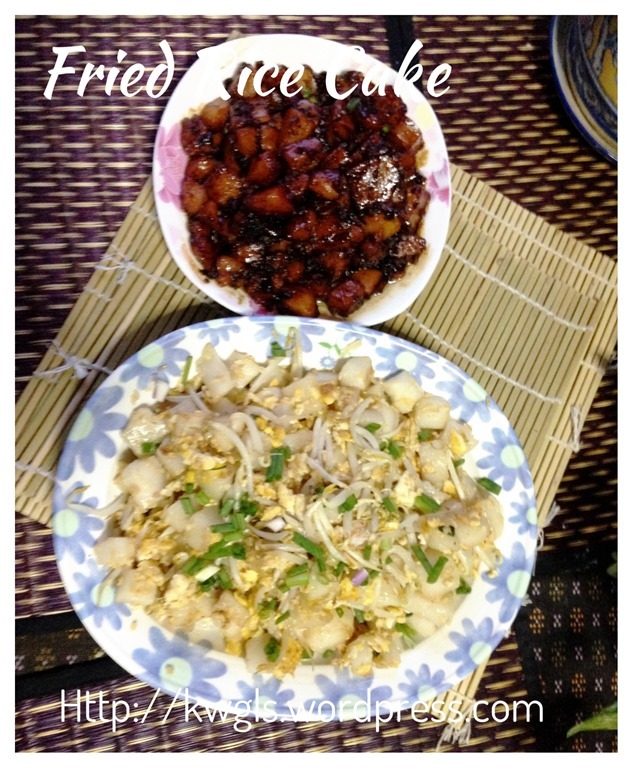 Some have added chives and beansprout and some have also added prawns and meats due to the affluence of income over the years and localization of regional ingredients. But in Malaysia and Singaporean version, there is one common ingredient that all variants are using. It is the preserved radish.. and surprising, this is not found in traditional Chinese recipe.. 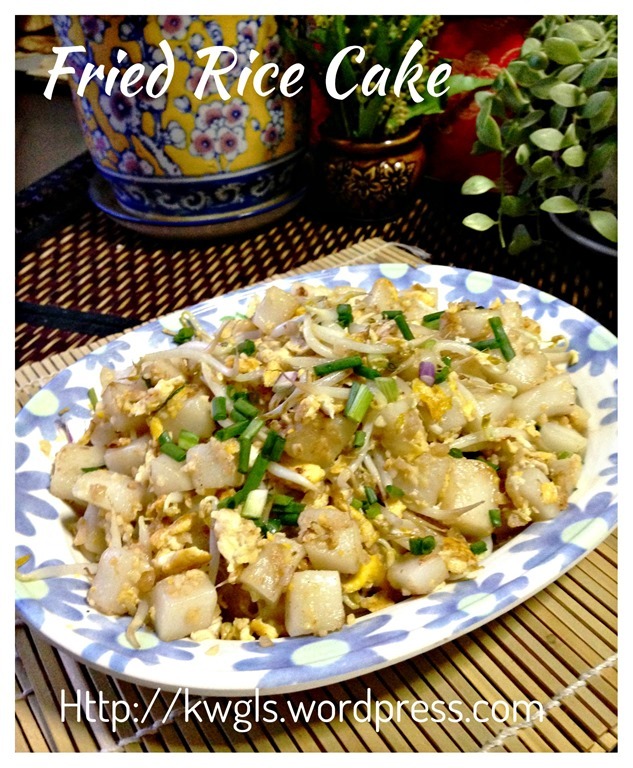 It was believed that in earlier years, Chinese immigrants in Singapore and Malaysia are rather poor and they have used preserved radish to flavour the fried rice cake and come out a unique flavour on its own..
After readers digesting the recipe, readers will know that this rice cake is a very humble recipe comprising only flour and water.. 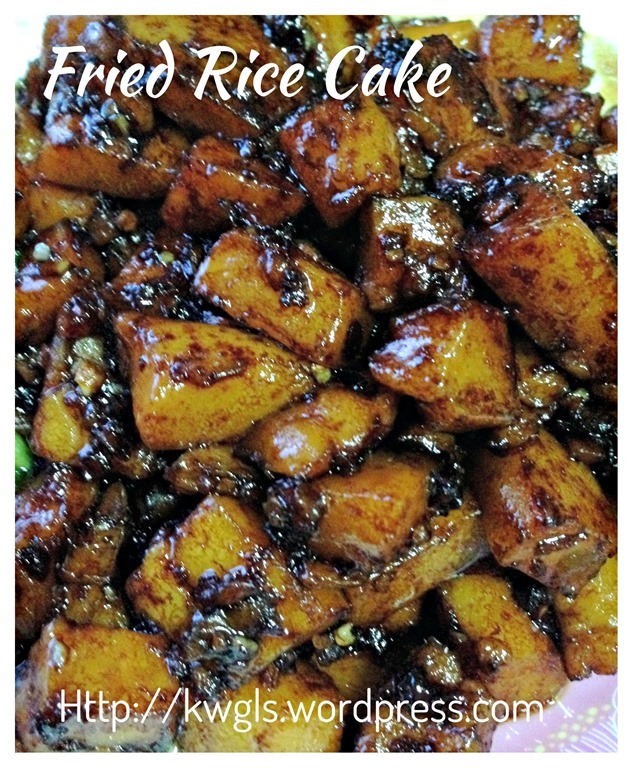 It was called Char Kuih in Kuching because we are frying a tray of steamed kuih or rice cake. 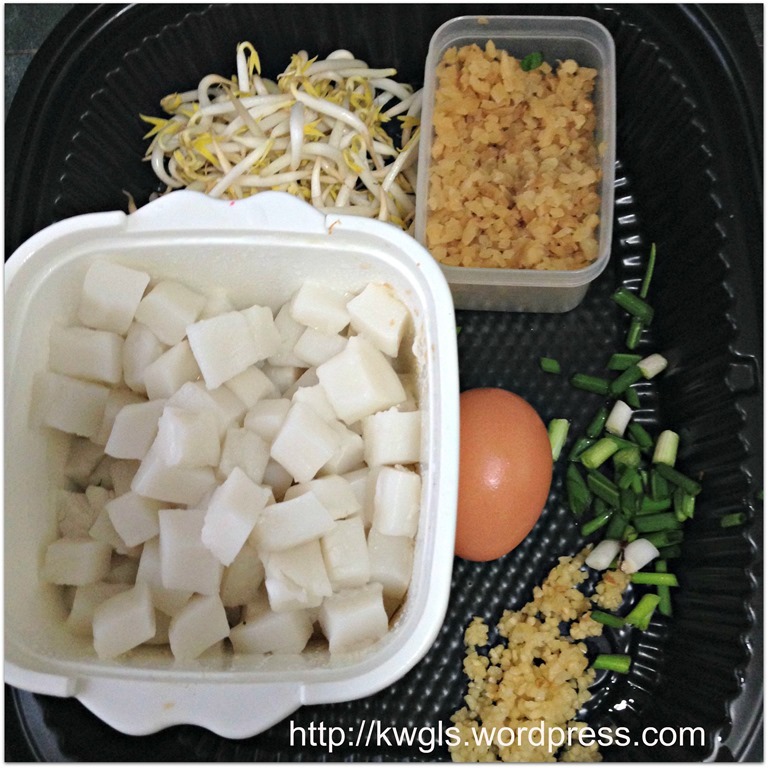 Penang called it Kuih Kak possibly because it was cut into small cubes that have many corners before the stir frying. 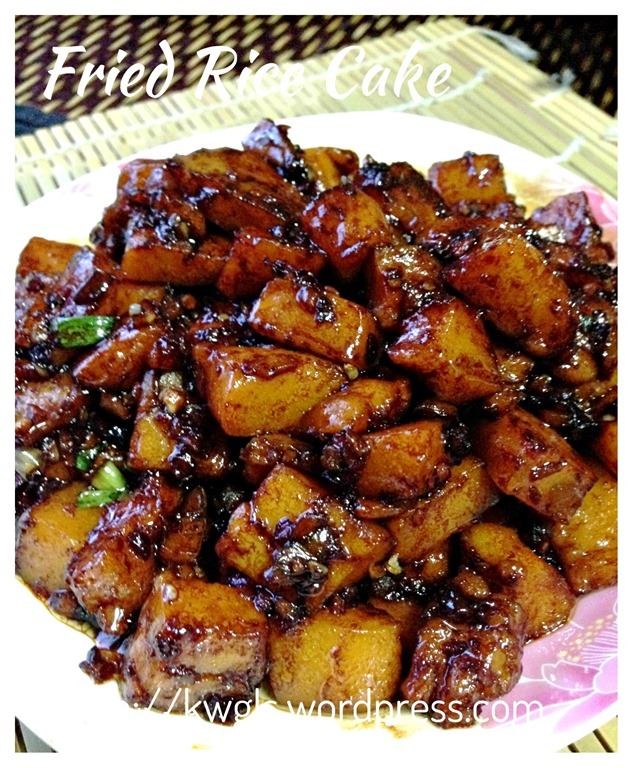 But why Singapore and Southern Peninsular Malaysia called it Char Cai Tow Kuih or fried radish cake since there is no radish in it? Or Singapore hawkers really used radish in the kuih? I was rather confused too. I also thought that Singaporean version may have radish since it was called as such. 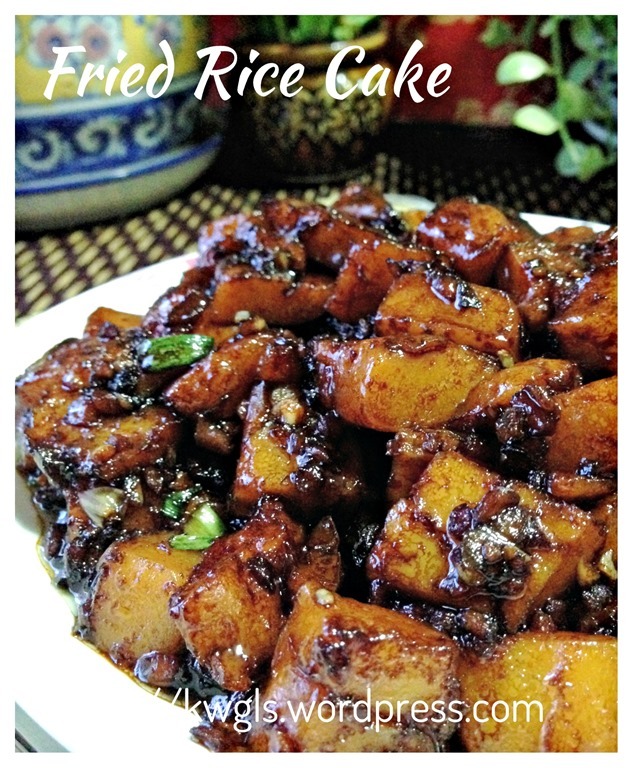 I knew that I was wrong when a Chinese article explained that it was called as such because it was fried with cai poh or preserved radish. 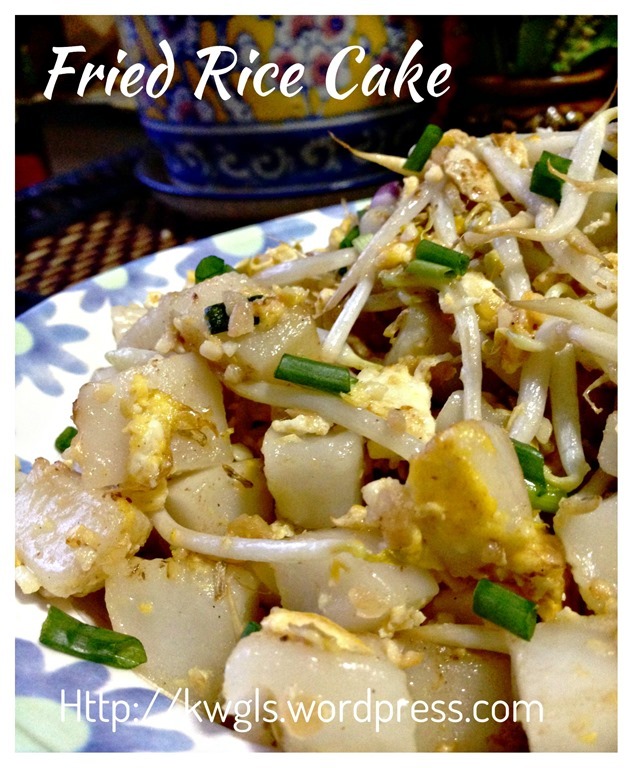 Hence it was called fried radish cake …Even if the cake have radish, the quantity will also very minimal.. Hmmm, is it not food history very interesting and now I am totally convinced that whatever name it was called, they were all the same rice cake and the rice cake may not have any radish at all. 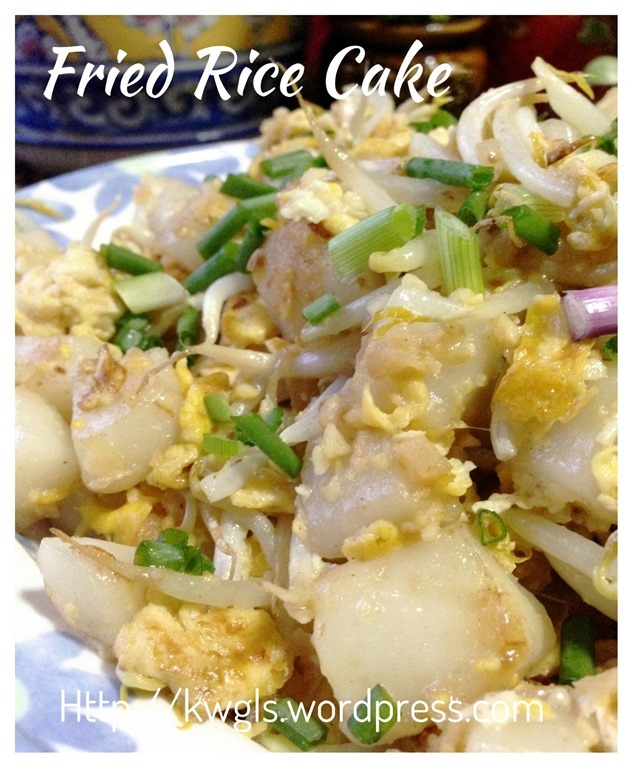 This is a recipe that requires steaming of the rice cake.. However, as steaming will take a long time , I have decided to prepare the rice cake using microwave.. Trust me, it only took about 3 minutes (depending on the height of the rice cake and how big is your container) and the texture will not be compromised. Of course, those who do not have an microwave oven can use steaming as a cooking method. Mix all the ingredients for rice cake in a greased microwavable container. Stir until well mixed. Heat in the microwave oven for about 3 minutes. 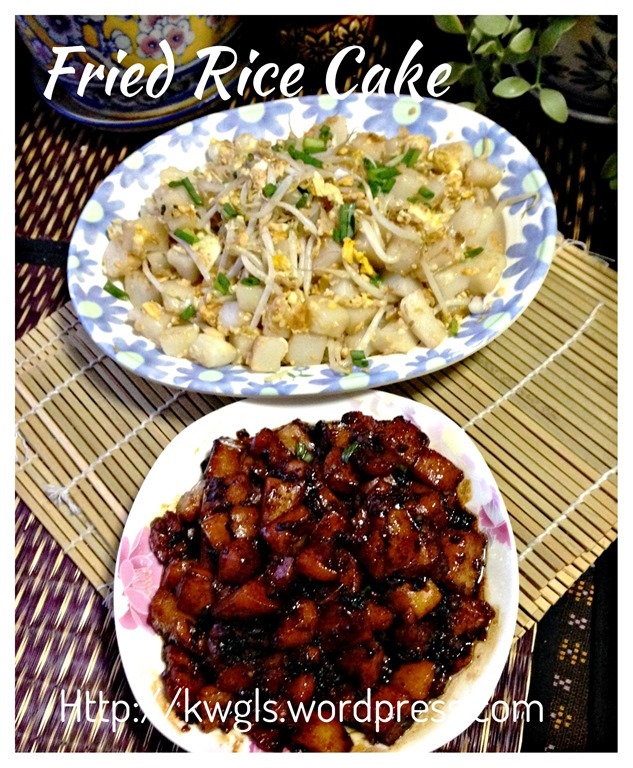 Depending on the size of your container and the height of the rice cake, the timing is for your reference. 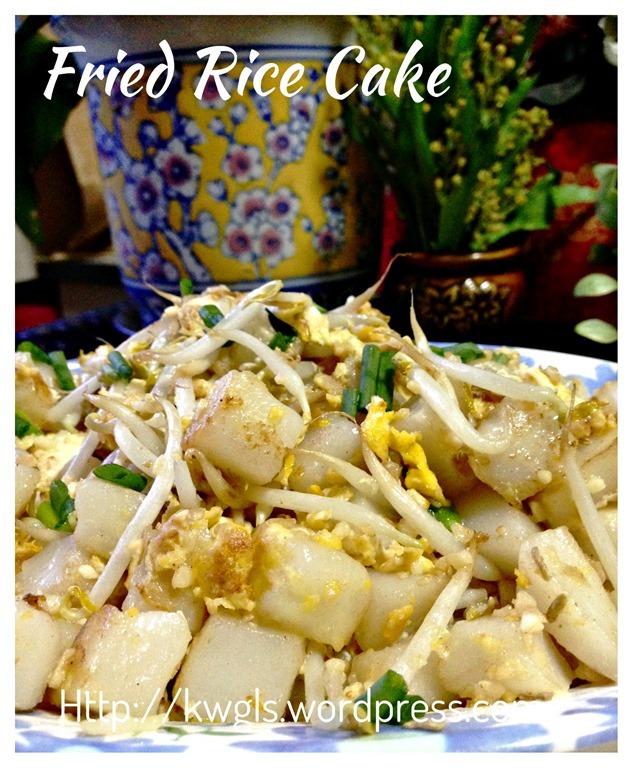 It is considered as done when a toothpick inserted into a rice cake comes out clean. Even a bit of stickiness is acceptable as it will set when cooled. Do not over microwave as the rice cake can become chewy if too much water is lost. Cool completely (about 1 hour) before cutting into about 1 cm cube. 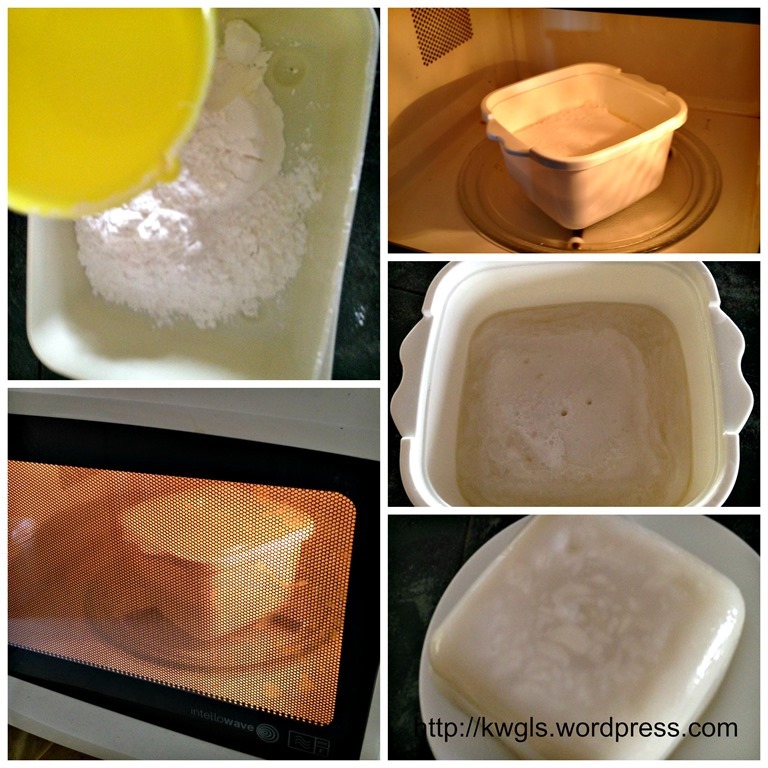 If you do not have a microwave oven, you will need to cook the rice flour solution over the stove until sticky like glue. Transfer the paste into a greased container. Steam under high heat until the rice cake is set. Cool completely before cutting. 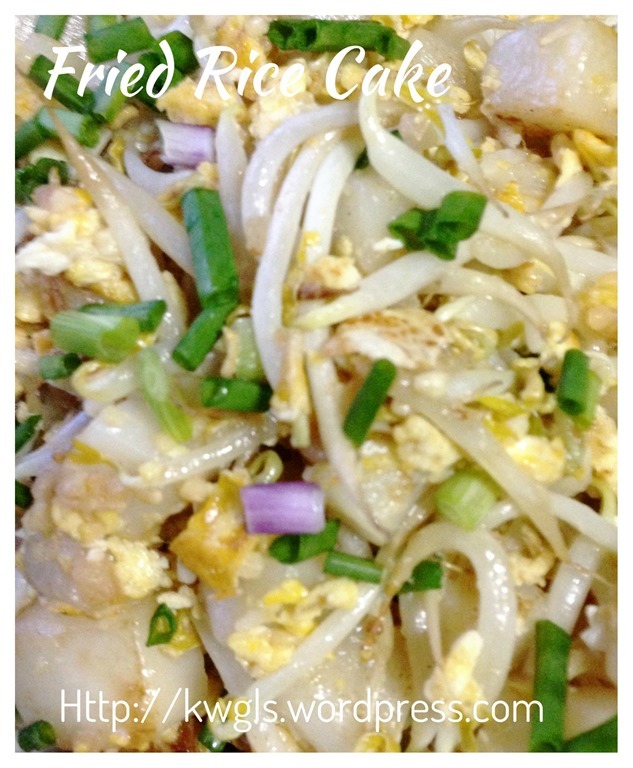 You can refer to the source recipe for how to steam the rice cake. In a frying pan, heat up some cooking oil or lard, sauté the preserved radish and minced garlic until fragrant and the garlic turn slightly brownish. 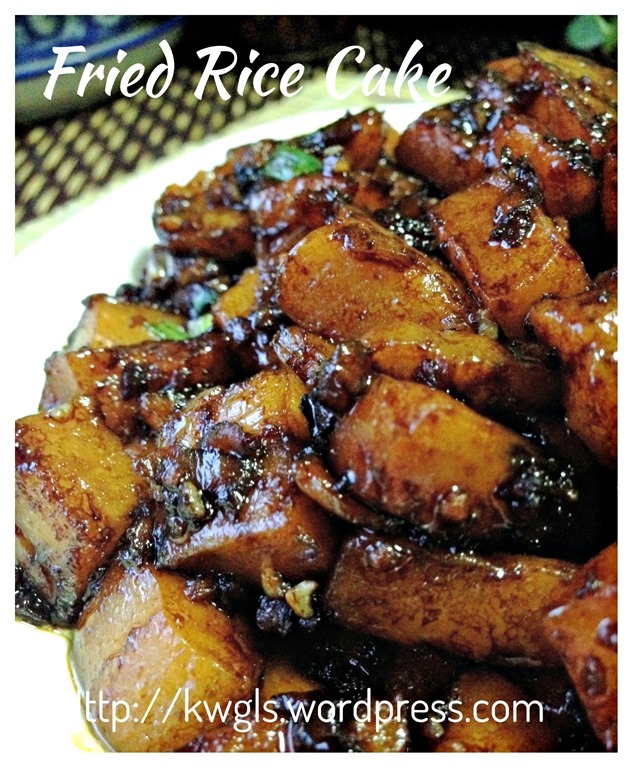 Add the rice cake cubes, stir fry until the rice cake cubes is a bit golden brown…Add the sticky dark soya sauce and sugar, stir fry until well combined. (note: if the dark soya sauce is sweet soya sauce, no sugar need to be added. 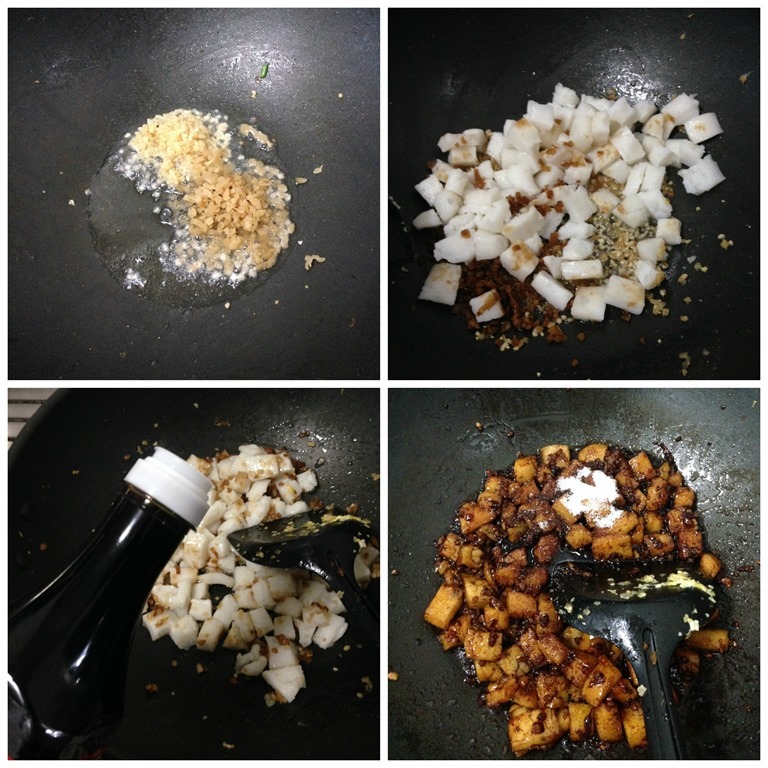 You can also use dark palm sugar for the stir frying in place of castor sugar). Dish up and garnish with chopped spring onion before serving. (note: Stir frying shall be done under high heat for the entire cooking process). 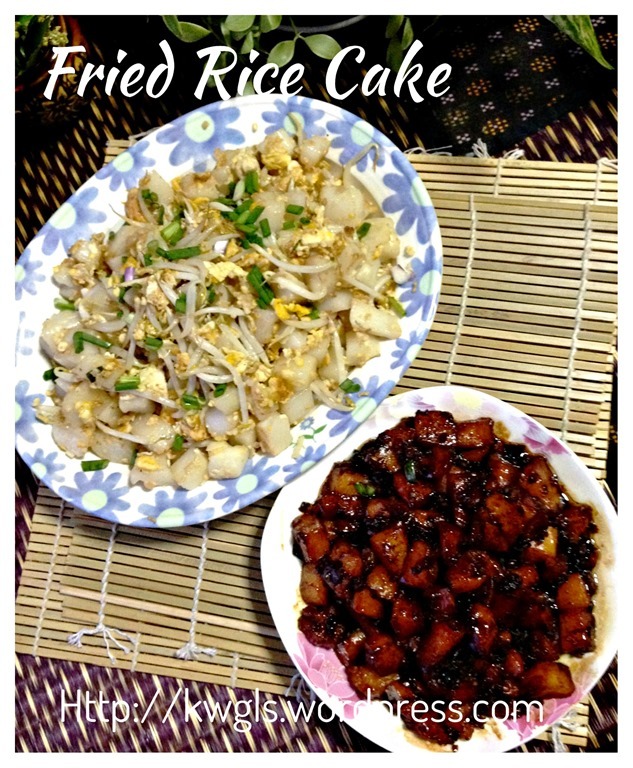 This entry was posted in Chinese and Asian Cakes and Snacks, Food Preparation Series, Noodles, Rice and Others and tagged 8, Char Kuih, Char Kuih Kak, 炒粿, 炒粿角, 炒糕粿, 炒菜头粿, 炒萝卜糕, Fried Carrot Cake, GUAI SHU SHU, Guaishushu, kenneth goh, postaday, Teochew char kuih. Bookmark the permalink. This is my favourite dish, thank you so much for the short cut version. 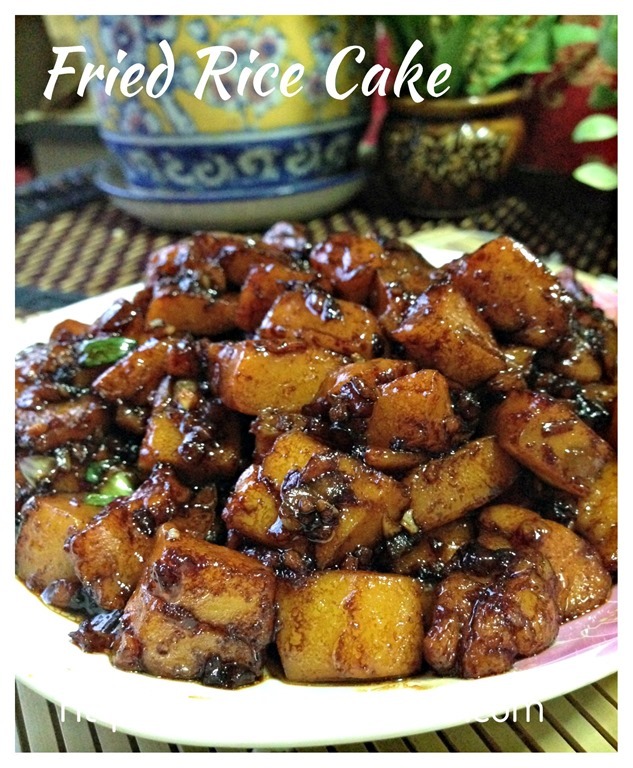 Hi Shi fu, my kuih is a bit hard… I used tapioca starch instead of flour. Is it the reason? They r different? 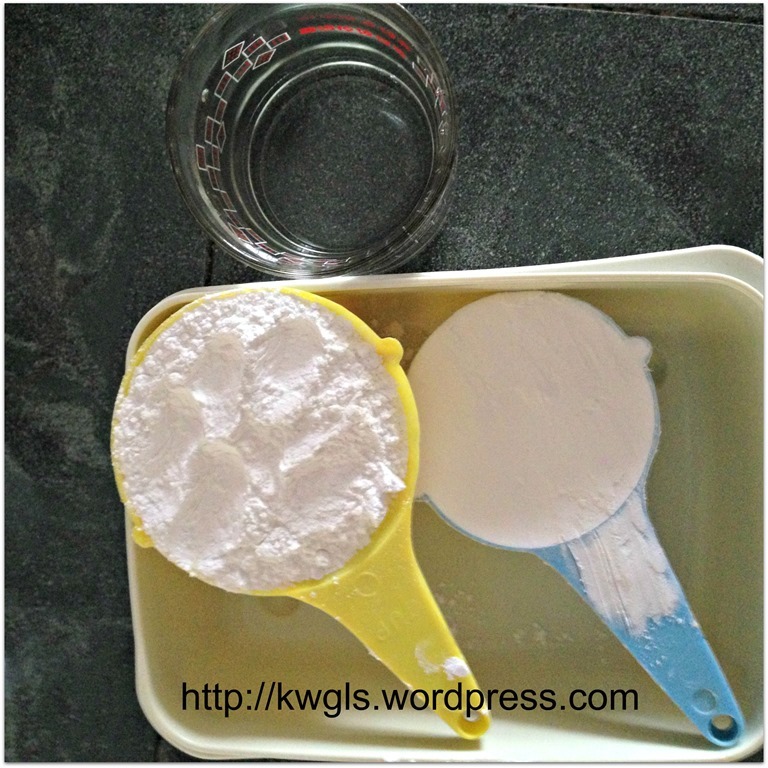 100% tapioca starch… It become like plastic.. You can’t use 100% tapioca flour..